FreeClyde Records, in association with BuySoundtrax Records, presents the original soundtrack to HELEN OF TROY, featuring music composed by Joel Goldsmith (STARGATE UNIVERSE, STARGATE ATLANTIS, STARGATE SG-1) for the 2003 television mini-series directed by John Kent Harrison (GAME OF YOUR LIFE, YOU KNOW MY NAME), starring Matthew Marsden (RAMBO, RESIDENT EVIL: EXTINCTION), Rufus Sewell (DARK CITY, A KNIGHT’S TALE, THE ILLUSIONIST), James Callis (BATTLESTAR GALACTICA), John Rhys-Davies (RAIDERS OF THE LOST ARK, FELLOWSHIP OF THE RING), Maryam d’Abo (THE LIVING DAYLIGHTS), Stellan Skarsgard (GOOD WILL HUNTING, KING ARTHUR, GIRL WITH THE DRAGON TATTOO) and Sienna Guillory (THE TIME MACHINE, RESIDENT EVIL: APOCALYPSE, THE HEART OF THE EARTH), as Helen. Based on THE ILIAD, one of the most epic adventure stories of all time, HELEN OF TROY was originally broadcast in two parts on the USA Network in 2003. Inspired by Homer’s classic tale, shot in exotic locations, featuring an international cast and state-of-the-art special effects, HELEN OF TROY was an attempt to depict the legendary battle fought to win the love of the world’s most beautiful woman and make it relatable to a modern audience. HELEN OF TROY tells the story of Helen (Guillory) who is married to Menelaus, King Of Sparta (Callis) but falls madly in love with Paris, Prince Of Troy (Marsden). Together, the lovers flee Sparta for Troy, where Paris’ father, Priam (Rhys-Davies) offers them safe haven. Menelaus’ brother, the ruthless Agamemnon (Sewell) uses the excuse to recover Helen for his brother as an opportunity to expand their empire by invading Troy and leads the Spartan army to the shores of the legendary fortified city. After a siege of ten years, the Spartans change their tactics and are able to gain entrance to Troy by hiding within the fabled Trojan Horse, allowing them to strike from within and bring the Trojan War to a tragic close. Long anticipated by fans of the composer, HELEN OF TROY was one of the biggest projects of Joel Goldsmith’s career but did not receive an album release at the time. FreeClyde Records, to be distributed by BuySoundtrax Records, now presents the original television soundtrack to HELEN OF TROY on compact disc for the first time, featuring music composed by Joel Goldsmith for the epic mini-series, produced by the composer and mastered by James Nelson of Digital Outland. 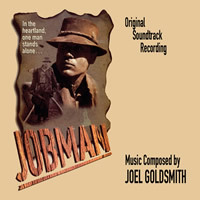 Orders placed through www.buysoundtrax.com will receive a special bonus disc of Joel's score to the 1990 film JOBMAN which was prepared by the composer as a gift to his fans. HELEN OF TROY is a limited edition of 1000 units.